- Semi-rigid plastic Tags of 0.5 / 0.7 mm thickness. - All the Tags can be attached with a Saf-T-Lock devices directly or they can be attached with the help of a Nylon Tie. - Individual workers use the DANGER TAG while working on the equipments. ur company is manufacturing quality range of Tags of varied kinds. These Tags are widely demanded by several industries, shops and offices to give information about the products and their prices. These Tags are carefully manufactured by quality raw material like quality paper. We are one of the leading manufacturer and supplier of Warning Tags , we are supplying wide range of quality products with efficient pricing. 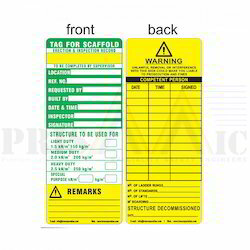 We are presenting an excellent quality assortment of Radium Warning Tag. Car Bike Highly Reflective Reflector Radium Warning Tag Ribbon Assorted Color And Design. Warning tags are used to indicate that an immediate hazard exists that has some probability of causing death or serious injury. 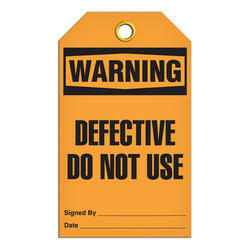 Keep your employees safe with our safety warning tags. In-Mold technology utilizes robotics and a patent pending method that capitalizes on the advanced properties of plastic materials in the molding process. - PVC coated 0.7 mm White color sheet . - Resistive to water and oil . - Customizable as per client requirements. - Nylon cable can be provided if required. Matching up with the requirements of our clients, we are involved in offering Warning Tag.